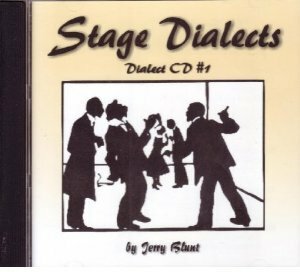 The Stage Dialects 3-CD Set, along with its companion book (sold separately), are the definitive work in their field and have been used by professional actors and directors, high schools, colleges and universities throughout the world. Master Teacher Jerry Blunt selected the most used dialects in the literature of the theatre (along with the phonetic alphabet). Each dialect is broken down into key sounds: vowel substitutions, dipthongal changes, consonant substitutions, special pronunciations and pitch patterns. Primary source voices on the CDs accompany the text for listening and drill. So listen, learn and ENJOY! Intended to accompany Stage Dialects, this set of 3 CDs includes: (CD #1) Japanese, Standard English, American Southern; (CD #2) New York (Brooklyn), Cockney, Irish, Scottish; (CD #3) French, Italian, German and Russian. Jerry Blunt (1907 – 1992) helped found the drama department at Los Angeles City College (LACC ). A former chairman of the drama department, Blunt was a popular teacher for 42 years. His students have won Oscar, Emmy, Tony, and Pulitzer Prizes.